I used the Knifty Knitter purple long loom usually sold individually, knitted 20 rows using the figure 8 style wrap with Lion Brand Woolease Thick & Quick in seagrass. I bound off by threading the working yarn onto a yarn needle and sewing through all the loops. Then I stitched the bottom and side together seamlessly using the mattress stitch. To give the top a finished look, I used a large crochet hook to single crocheted around the opening. A crocheted chain of 6 was also added to the middle back of the opening, then tacked back down to create a closure loop. For the handle: I placed the 2 loops of the top of the bag where I wanted the handle to begin, up through the inside of the blue round loom, and onto two pegs. A 2 peg I-cord was then created to the length I liked for the finished purse. The finished end was tacked down to the other side of the opening. I created a small tassle using 4 strands of the yarn. These were pulled through a loop on the front top of the bag, and another length of yarn was used to tie around the strands to form the tassle. The beads were a little tricky…I finally figured out that the yarn strands could be unraveled, and threaded inside a length of thin craft wire bent in half, then pulled (sometimes with the aid of pliers) through the hole of the beads. These were threaded randomly on the strands, and knots were tied to each strand end. Wah, La! So Cute! *This little pic is a sneak peek of something NEW!! 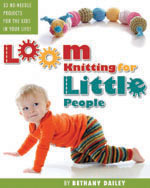 This entry was posted in Free Loom Patterns, Knitting, Loom Knitting, Looming Patterns, New Projects, Project Preview. Bookmark the permalink. I am going to give this a try. I dont even know some of the stitches, like the mattress, or know how to crochet (lol) but I am going to try it this next week. Thank you so much for the time/effort you put into this website and sharing. Hi Christina! 🙂 I’m so glad you’re excited to give this one a try…it really is a simple project, and one that has fast results for quick satisfaction. Hope that helps! I’d be very happy to see your results and feature them on the Clique Pics page here at the site too!